This volume contains nine survey articles based on the invited lectures given at the 25th British Combinatorial Conference, held at the University of Warwick in July 2015. This biennial conference is a well-established international event, with speakers from around the world. The volume provides an up-to-date overview of current research in several areas of combinatorics, including graph theory, Ramsey theory, combinatorial geometry and curves over finite fields. Each article is clearly written and assumes little prior knowledge on the part of the reader. The authors are some of the world's foremost researchers in their fields, and here they summarise existing results and give a unique preview of cutting-edge developments. 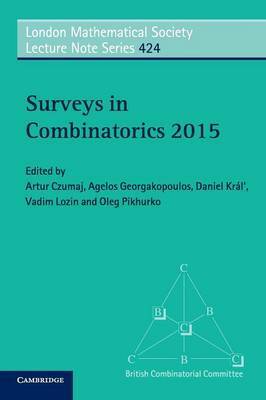 The book provides a valuable survey of the present state of knowledge in combinatorics, and will be useful to researchers and advanced graduate students, primarily in mathematics but also in computer science and statistics.